Pure blood, mud-blood. What's the difference? Well, if you ask Malfoy, it's the difference between belonging at Hogwarts and not. We think they are equally as great, but Malfoy has a much different opinion than us - most likely because of his parents - so we'll give him a pass. For now. Some students that attend Hogwarts School of Witchcraft and Wizardry have come from families who have legacies there. That their grandfather's grandmother on the second side has gone, and everyone since has been a student. Draco Malfoy is one of those up and coming wizards who think that Hogwarts should be a school left to those who have families of wizards who have made names for themselves. 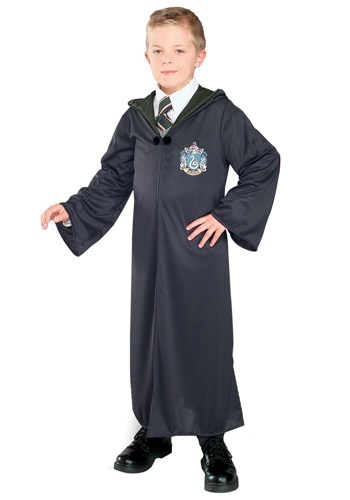 Now your child can become the blonde wizard with an attitude in this robe costume. This iconic officially licensed Slytherin rob makes the perfect Draco Malfoy costume for Halloween. If you are a Harry Potter fan, then this is a must-have costume. The long black robe is made of 100% polyester and has green lining around the edges. The attached hood also has a green lining to emphasize that it belongs to Slytherin. The Slytherin crest is printed on the chest and it comes together with a black clasp at the neck. Add a wand for the perfect wizard costume! And who knows, maybe after a while you'll have a soft spot for mud-bloods, muggles, and everything in between!